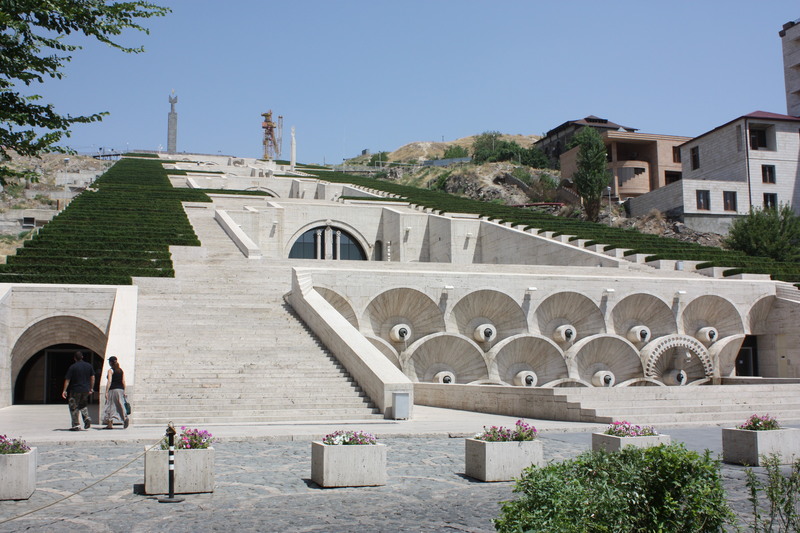 Enjoy the Cascade in Yerevan | Where to next? 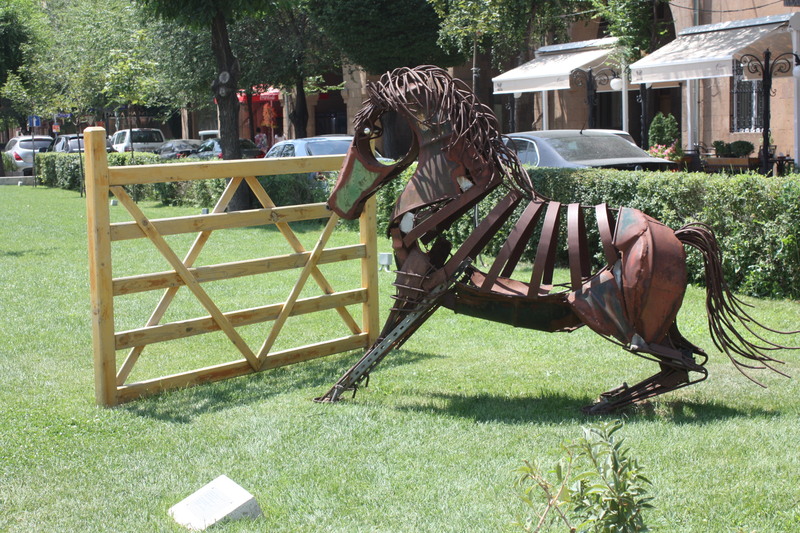 Armenia and Yerevan, its capital, were amazing bonus stops on our London to Sydney jaunt. Armenia wasn’t even on our original itinerary, but good roads in Turkey put us a few days ahead of schedule, so we swung through this welcoming and fascinating country. The Cascade is one of Yerevan’s gems. Built—at least started—in the 1970s, the Cascade sweeps about seven or eight stories up a steep hill in the city. You can walk up the outdoor stairs or glide up the indoor escalators. The day we visited was a scorcher, so we rode instead of walking—most unusual for Poor John and me. But it was worth it. Plenty of contemporary artworks grace the sides of the many banks of escalators (I wish I had counted exactly how many levels there are). There are more artworks at the top and still more in the gardens at the front of the Cascade. I should admit that there are also lovely artworks, landings and fountains on the outside staircases. After all, the name Cascade refers to the water that tumbles down the sides. The views from the top are great too. You can see the gardens below, much of the city and, on clear days, Mount Ararat in the distance. Of course, coming and going, you have to run the gauntlet of souvenir shops, but the salespeople aren’t overly insistent. All in all, I’d say Armenia is worth another visit. It was gorgeous, but gosh it was hot. Dillard and Reva Griffith Premed Kearney 1957-58. Good luck with your search Dillard. I wouldn’t even know where to begin. The tongue and lips art is actually a chair; so is the hand. In fact, most of the artworks on the internal stairs were chairs. I know that cat look, so can see the couch in my mind’s eye. This is amazing stuff! Not all art museums allow photography, but I’m thrilled this one did. How else are those of us who can’t reach Armenia see it for ourselves?